Albedo/color dichotomy occurs on a planetary surface, which is characterized by two spectrally different terrains of regional to hemispheric/global scale. Albedo dichotomy may be related to partial coverage of the surface by liquids, frost, ices, fine-grained atmospheric dust, materials from space, or related to processes such as sublimation, high-energy particle impacts, differences in grain size, composition, or material age/maturity, etc. The Moon shows an albedo dichotomy of high-albedo terra/highland (impact ejecta) and low-albedo mare (Moon) (basaltic plains) surfaces. The surface of Mars displays low-albedo terrains dominated by mafic sand-sized materials and high-albedo terrains covered by dust (Ruff and Christensen 2002; Albedo Feature: Mars). Ganymede’s bimodal surface consists of young, bright, grooved terrain (Groove, Ganymede) and old, heavily cratered, furrowed, dark terrains (e.g., Galileo Regio) (Furrow, Icy Moon; Nimmo and Pappalardo 2004 and references therein) that are large scale but do not show hemispherical differences and occur in polygonal blocks (Murchie et al. 1990). The dark terrain exhibits heterogeneous albedo at small (dekameter) scale. Bright material, thought to be composed of clean water ice, is usually found at topographically high elevations (knobs and massifs), while dark material is typically found in topographic lows (dark plains). The coexistence of bright and dark material in topographic lows is most consistent with a clean ice substrate which is contaminated with dark material from early impacts. The dark material concentrates on dark plains as sublimation lag deposit and forms a thin veneer (Prockter et al. 1998). Hemispheric color and albedo asymmetries: Tethys (Fig. 1), Dione, and Rhea display double hemispheric asymmetries (Buratti et al. 1990; Schenk et al. 2011). Trailing hemisphere: the center of the trailing hemisphere displays an increase in redness (IR/UV ratio) and decrease (darkening) in albedo, suggested to be produced by magnetospheric thermal plasma bombardment (charged-particle radiation; “magnetic sweeping”). Leading hemisphere: similar but weaker enhancement is observed at the center of the leading hemisphere, produced by the bombardment of E-ring particles. These color features are not associated with any detectable albedo variation. Equatorial lenses and equatorial band: a dark bluish equatorial band is observed across the leading hemisphere of both Tethys and Mimas (Fig. 2). Equatorial lenses are proposed to be produced by the impact of the most energetic particles whose motion is opposite to the motion of the inner satellites and therefore can collide with the leading hemispheres (Schenk et al. 2011). Cassini Regio on the leading side has very low albedo (0.06 on average with 0.02 for dark material), whereas the poles and the trailing side are relatively bright (0.25 on average with 0.38 for bright material; Blackburn et al. 2011) except for topographic lows. Albedo boundaries are very sharp (Figs. 3 and 4). A further dichotomy of a redder leading hemisphere and less red trailing hemisphere is also observed (Blackburn et al. 2011 and references therein). The dichotomy may be caused by a thermal feedback process in which bright water ice sublimes, leaving behind a dark lag deposit (Galuba et al. 2012; Sublimation Landforms: differential sublimation due to albedo differences). Volcanic flows/eruption. This model can be associated with the formation of Iapetus’ equatorial ridge. Geyser-like activity in connection with the equatorial compressional ridge producing the dark coating (Illés-Almár 2006). Exogenic coating (Soter 1974): dark materials are remnants of circum-Kronian dust deposits ejected from the low-albedo dust-covered outer irregular satellite Phoebe. This satellite orbits retrograde, and retrograde orbiting dust particles would impact Iapetus, which is prograde, at high velocities on its leading side (Tamayo et al. 2011). The discovery of a dust ring at the orbit of Phoebe validated this model (Blackburn et al. 2011). It is also supported by the observation of dark materials concentrating on the leading hemisphere and independent of local morphology (Kimura et al. 2011 and references therein). However, this process would produce gradual changes at albedo boundaries that are inconsistent with observations that show sudden change at albedo boundaries (Tamayo et al. 2011 and references therein). Furthermore this model would demand that the surface inside the entire cross section of the leading side, and only inside this cross section, should be dark, which is not the case (Illés-Almár 2006, 2012). The surface of Europa exhibits two major terrain types: the bright ridged plains and the darker mottled terrains that form by the disruption of the ridged terrain (Pappalardo et al. 1999). The (mottled terrain (Europa)) on the leading hemisphere show yellowish color in VIS (yellow or high-UV mottled terrain), while those in the trailing hemisphere are brownish (brown or low-UV mottled terrain) (Denk et al. 1998). The difference is thought to be caused by differences in magnetospheric influences as high-energy particles impact or overtake Europa from behind (i.e., in the trailing hemisphere) due to the faster rotation of the Jovian magnetosphere than the orbital velocity of Europa (Johnson et al. 2004). The purest H2O is found on the leading hemisphere (Carlson et al. 2009). The yellow hue in the leading hemisphere could be caused in part by the exogenic sulfur input from Io (Eviatar et al. 1981), while the sulfur could also be of endogenous (e.g., subsurface oceanic) origin (Spencer et al. 1995; Chaotic terrain (Europa)). The trailing hemisphere is darkened and reddened by the implantation of sulfur into the surface ices (Schenk et al. 2011). The surface of Earth is characterized by low-albedo water bodies (Jin et al. 2007) and medium albedo continents (Fig. 5; Albedo feature Terrestrial Analog). Albedo asymmetries between the leading and trailing hemispheres of Europa and Ganymede were reported by Pilcher et al. (1973), and the dichotomy was observed by many others (Malin and Pieri 1986 and references therein). Soon after its discovery by Cassini in 1671, Iapetus became so faint that it was lost and not recovered until the following year (See 1910, p. 352). 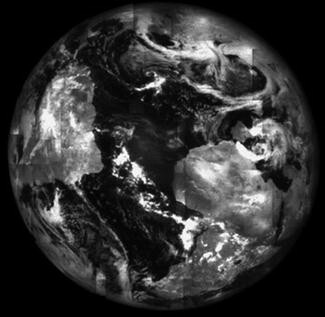 See (1910) proposed that this hemispheric darkness is caused by features similar to lunar maria.